Last weekend saw our annual upgrade to Blackboard. Blackboard are moving away from providing updates in the form of service packs, towards a model where they will regularly release updates to the different components of the software. The theory is this will result in quicker fixes to problems as and when they arise. While Blackboard itself still supports Internet Explorer 9, Turnitin, Aston Replay, and Kaltura do not. You will need to upgrade to version 10, or use one of the other supported browsers. If you don’t know what version you’re using, whatbrowser.org will tell you. If you’re on a PC managed by Aston University, contact the IT Services Helpdesk who will upgrade you. The upgrade over the summer will remove the requirement for Silverlight when viewing sessions (eventually!). 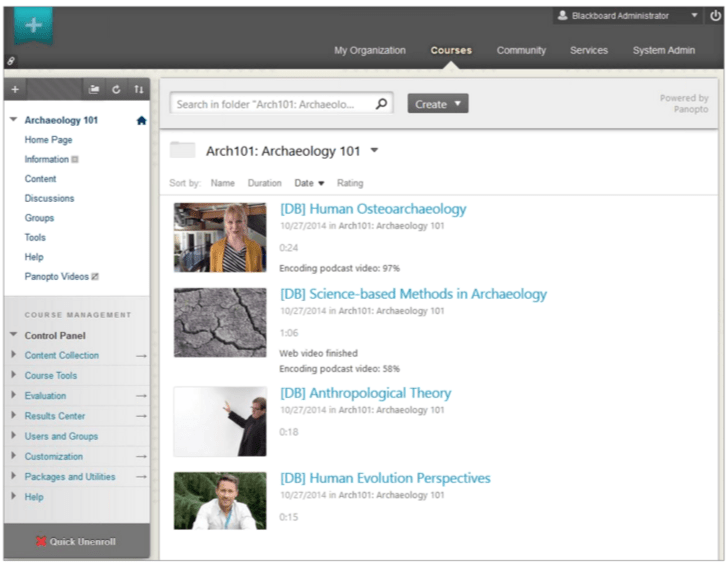 There’ll also be a new interface in Blackboard, right, showing thumbnails to sessions and let your students search through the Replay sessions. We’ll post more details and dates on the Replay TLC site in the near future. From the summer, Collaborate will be available in two flavours – Classic and Ultra. Classic is the current version of Collaborate. Ultra is rewritten from the ground up and, more importantly, removes the requirement for the launcher! Ultra won’t be available for you to create sessions in Blackboard until later in the summer. However, we’re hoping to get access to Collaborate Ultra from next week, so we’ll be able to create test sessions for you. There’ll be more information about this on the Collaborate TLC site in the upcoming weeks, but here’s a video to whet your appetite. All being well, we’ll have access to the beta version of the Turnitin document viewer at some point over the summer. While we won’t be rolling this out onto Blackboard just yet, we will give access to it via our test servers for those who are interested in seeing what’s coming in the new version.